Fig. 1. The Inner Studio, Tenth Street, c. 1883. Oil on canvas. The Huntington. Gift of the Virginia Steel Scott Foundation. This is the first published photograph of the painting after a Spring 2016 surface cleaning. Fig. 2. William Merritt Chase, Self Portrait in 4th Avenue Studio, 1916. Oil on canvas. Richmond Art Museum, Indiana. From the Gilded Age to the present, Chase has not been known for the poetic or the chimerical. As Royal Cortissoz put it: “It was [Chase’s] virtue that he kept his eye on the object and painted it as he saw it . . . . Of imagination he never revealed even the slightest trace.”2 More recently, Sarah Burns has characterized his art, in particular the paintings of his New York studio in the Tenth Street Studio Building, as the “paradigm of the aesthetic commodity: the luxuriously coated surface, the precious object celebrating the joys of seeing a material world full of delectably lovely things.”3 Chase as a materialist bound to what he can see, to the glittering surface of things, and his paintings is not challenged here. Instead, I make the modest claim that from time to time Chase pushed against this characterization. The Inner Studio, Tenth Street and Self Portrait in 4th Avenue Studio (1916; Richmond Art Museum, Indiana) (fig. 2) are separated by over thirty years, but each contain an unfinished canvas smattered with marks that do not add up to anything recognizable. No forms or possible subjects emerge. As will be shown, the trope of the unfinished canvas testifies to an inner vision not tied to visible appearances. According to Cortissoz, there was at least a “trace” of imagination, and perhaps on occasion, the artist could not paint it as he saw it because there was nothing to see but a cloud of brush marks. The earliest instance of an unfinished canvas appears to be the Huntington painting. In the painting, a man in spats with dark brown hair, a short hair style, and a tuft of a mustache is seated on a stool, taking in the framed canvas with its nebulous confection of blue, green, and red (fig. 3, and fig. 4 for detail of facial hair). A red covering is partially flipped over the frame as if it had been only recently and haphazardly removed. A print slightly curls as it rests next to the stool, perhaps having been put down moments ago. Its precarious position must be temporary. 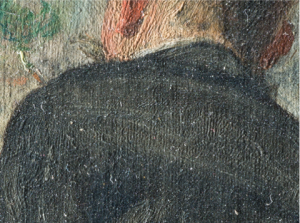 Sitting uncomfortably close to the painting and with his head turned down, the man cannot take in the entire composition and might be examining a detail. His proximity to the painting is underscored by the shadow he casts on the gilded frame. The man is thinking, not doing, contemplating the canvas that is waiting to be formed by someone. Whether it is by this man or someone else, this painting-to-be is potentiality waiting for an additional intervention to give it shape. Invisible conception will eventually be channeled into visible execution. Claiming that the unfinished painting in The Inner Studio,Tenth Street is a statement about the invisible imaginative labor of an artist contradicts the critical consensus that had developed around Chase as early as the 1870s. By then, he was already classed as an unpoetic artist grounded in the material world. Fig. 4. Detail in raking light, The Inner Studio, Tenth Street. Raking light highlights the distinct brushwork used on the mustache. In 1887, a reviewer of a Boston exhibition said that Chase has “such happy unconsciousness that art has any ulterior objects, any moral mission or historical function!”4 Another wrote that “[W]hatever [the] eye can see, he is able to comprehend and reproduce.”5 In 1881, the influential critic Mariana Van Rensselaer pointed out: “I do not think that Mr. Chase will ever prove that he possesses imagination of the idealizing sort that can sometimes vitalize the most alien materials and make them valuable.” She adds: “He is not a dreamer of dreams, or a seer of visions, or a romancer, or an idealist of any sort.”6 To be clear, this was not a detriment. She lauded his work and placed him within the lineage of Diego Velázquez and Frans Hals. Whether or not this is Chase, The Inner Studio, Tenth Street is a pictorial retort to the likes of Van Rensselaer. Whoever he is, this man is a “seer of visions” who is vitalizing “alien materials” owing to the prompting of the painting. Fig. 5. William Merritt Chase, Duveneck in His Studio, 1876. Oil on canvas. Private collection. Source: Inventories of American Painting and Sculpture, Smithsonian American Art Museum. The melancholic Chase is like Hamlet brought to inaction by his thoughts. In the canon of English literature there can hardly be a better figure to epitomize a division between thought and action. Fig. 6. 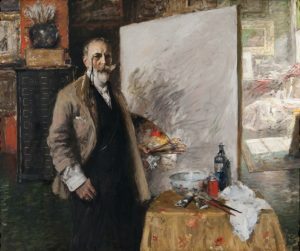 Thomas Hovenden, Self-Portrait of the Artist in His Studio. 1875. Oil on canvas. Yale University Art Gallery. There are precedents for portraits of artists immersed in the intellectual effort of creating a painting. In a portrait from the 1870s, Chase depicted Frank Duveneck lost in thought instead of in the act of painting (fig. 5). 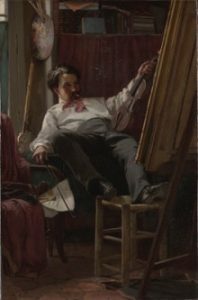 Legs sticking out and slouching with his head resting on his hand, his brush and palette are at rest. Part of a cohort of American artists studying in Munich, Duveneck and Chase traveled together in Italy and shared rooms in Venice.9 Nearly perpendicular to the picture plane and almost bisecting the canvas, the object of Duveneck’s attention is out of view, yet it gives structure to the composition. 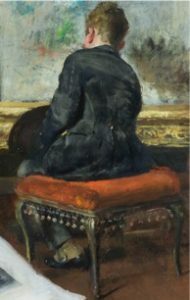 A Thomas Hovenden self portrait from his bohemian youth in Paris also contains a painting out of view (fig. 6). Hovenden reflects on the fickle nature of inspiration. Holding a bow in one hand and a violin in the other with a burning cigarette in his mouth, the artist sprawls lazily in a position not conducive to playing the instrument or to painting. In a state of languorous distraction, he stares at the unseen canvas. Smoking, his mind gnaws away at an aesthetic problem while his body is at rest. Around the time of The Inner Studio, Tenth Street Chase represented himself and another artist, Worthington Whittredge, at work on a painting that is placed so the back or side are the only visible parts. The artwork is treated like an object, a stretched piece of canvas, instead of a window into a fictive world. For example, in his portrait of Whittredge, another occupant of the Tenth Street Studio Building, a highly foreshortened frame juts out (fig. 7). 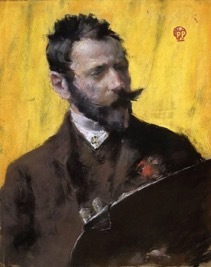 There is also a pastel self portrait of Chase at work, either holding a palette or a stiff board on which a sheet of paper is held while he draws (fig. 8). A painting seen from behind or only in partial view is common in portraits of artists at work, as in two extraordinarily famous examples: Rembrandt van Rijn’s Artist in His Studio (1628; Museum of Fine Arts, Boston) and Velázquez’s Las Meninas (1656; Museo del Prado). Fig. 7. William Merritt Chase, Worthington Whittredge. Ca. 1890. Oil on canvas. Crystal Bridges Museum of American Art. The painting in the Rembrandt is wholly obscured, but owing to a mirror, the subjects of the Velázquez painting, Phillip IV and Queen Mariana, are visible. While the unfinished canvas in The Inner Studio, Tenth Street and the unseen canvas in the Whittredge portrait seem unrelated, they accomplish the same end. Both prevent identification of the subject matter of the painting-within-a-painting and, therefore, divert attention toward the artist at work, whether engaged in manual or intellectual effort. It is as if the artistic process is best seen with the object of its labor out of sight. The unfinished canvas in the Huntington painting is part of Chase’s broader gambit in the 1870s and early 1880s to present himself as a cosmopolite. As John Davis has recently argued, Chase adopted a diverse set of subjects and painting styles as well as sought out exhibition opportunities in Europe in an effort to position himself as an international artist—a strategy that is unsurprising given the high prices American collectors were willing to pay for European artists.10 The Inner Studio, Tenth Street could therefore be yet another vehicle to assert his sophistication. Indeed, the formlessness of the unfinished canvas has precedents in Leonardo da Vinci and James A. M. Whistler, two famous artists who factor into the long history of images made by chance chronicled by H. W. Janson and more recently Dario Gamboni. Leonardo and Whistler, an old and a modern master, championed the indistinct as a legitimate part of art making. Fig. 8. 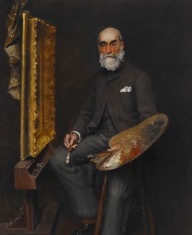 William Merritt Chase, Portrait of an Artist, c. 1883. Pastel on paper. Private collection. The story by Leonardo is one source for the unfinished canvas, but closer at hand is Whistler. 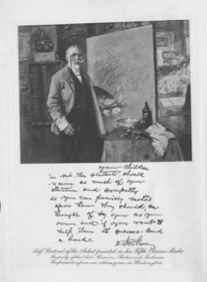 Although Chase did not meet Whistler until the summer of 1885, he knew about and promoted the artist’s work, successfully advocating for the inclusion of Arrangement in Grey and Black, No. 1: Portrait of the Painter’s Mother (1871; Musée d’Orsay) in the 1882 Society of American Artists exhibition.14 More to the point, splattered paint was the central image for the infamous libel trial between Whistler and the critic John Ruskin, who accused the artist of “flinging a pot of paint in the public’s face.” What Ruskin derided as a sham, Whistler defended as genius. In a manner of speaking, the trial hinged on proving the legitimate poetic and artistic potentiality of indistinct painted forms. New Yorkers followed the trial, and the New York Times ran an article, “Flinging Paint in the Public’s Face,” which complained that “nowadays it is too much the custom to present vague outlines, suggestions of bulky forms, shadowy indications of an unseen presence, and the mere framework of a phantasm.”15 Chase could have left the canvas blank or roughly sketched out a subject. Instead, he chose to slap on a mélange of marks, a timely image asserting the power of an artist’s inner vision that discerned forms where others saw only disorder or, in the case of Ruskin, fraud. A final context for understanding the unfinished canvas in The Inner Studio, Tenth Street is the Society of American Artists, a rebel exhibition society that was formed in response to the undiscerning standards and unfriendliness to younger artists of the National Academy of Design.16 Founded in 1877, Chase joined the society in 1879, shortly after returning from his studies in Munich. The society wanted to de-provincialize American art, consequently the inclusion of Whistler’s Arrangement in Grey and Black, No. 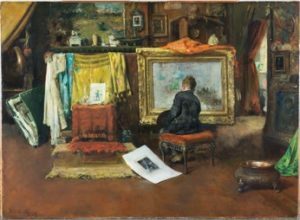 1 in 1882, where The Inner Studio, Tenth Street also hung.17 By including an unfinished painting, Chase nodded towards the notorious Whistler, an artist whose reputation had been secured abroad, and, therefore, a way to stake a claim as a cosmopolitan artist with European credentials. Fig. 9. Frontispiece. Katherine Metcalf Roof, The Life and Art of William Merritt Chase. New York: Charles Scribner’s Sons, 1917. From the early 1880s to 1916 is a long time, a whole career, and it is no surprise that the role of the unfinished canvas shifted. The one time revolutionary call for a loosely rendered Whistlerian painting was retardataire by the 1910s. The unfinished canvas went from a polemical rebuttal to critics to a sagacious sign to a middle aged artist of his limits. There was always a masterpiece around the corner, but Chase professed that he never exactly made the turn. In one of his last paintings, he features a yet-to-be-realized masterpiece, as if to declare his unrealized aspirations but also to remind his admirers that there was more to his art than could be taken in by material vision. About the Author(s): James Glisson is Interim Virginia Steele Scott Chief Curator, American Art at The Huntington Library, Art Collection, and Botanical Gardens.